Neem Seed oil is extremely rich oil which is semisolid in natural state. It is attributed mainly because of triglycerides and triterpenoid compounds, and has a strong fragrance. Neem oil is hydrophobic in nature. It also contains steroids and other naturally-occurring organic chemicals like triterpenoids. This oil has been valued for centuries in traditional Indian medicine to aid in the healing of topical skin disorders such as eczema, psoriasis, rashes, burns and acne. The main constituents of the neem carrier oil are Triterpenes more specifically, limonoids such as azadirachtin, salannin, meliantriol, nimbin, nimbidin, meliantriol, deacetylazadirachtinol, salannin, salannol, 3-deacetylsalannin etc. Neem Carrier Oil has a pungent, earthy, green musty smell with slight nutty scent towards the end. Neem carrier oil blends with most of the essential oils including almond, Jojoba, patchouli, Tea Tree, Patchouli, etc. 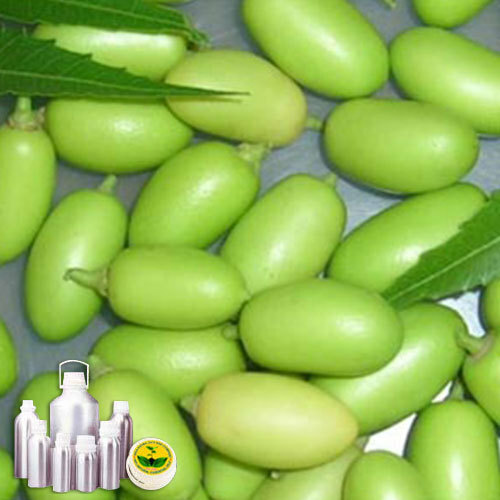 Neem oil also has medicinal properties and is used in various cosmetics as well. It is rich in fatty acids and glycerides and together with its healing properties, provides an excellent natural moisturizing base for various skin care formulations. Neem oil is an effective antiseptic, antifungal, antibacterial, antiviral, dermatological and dental agent. It is also widely hailed as a natural insect repellent. Major Constituents: Triterpenes limonoids such as azadirachtin, salannin, meliantriol, nimbin, nimbidin, meliantriol, deacetylazadirachtinol. We are Manufacturer, Exporter, and Supplier of 100% Pure and Organic and natural Natural Essential Oils, Therapeutic-Grade Essential Oils, Unadulterated, Organic and natural Essential Oils, Carrier oils, Herbal Extract Oils, and Raw Materials. These natural oils are broadly used for Aromatherapy, Ayurveda, Flavors, in Spa treatment centers, Perfumes, Perfumery Cosmetics, Pharmaceutical products and more. We obtain the natural content from sustainable sources as well as from where finest natural content is available. By processing the found content, our oils result from nature to shelf.